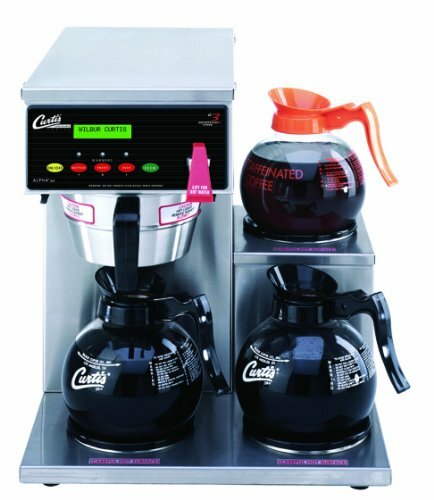 PRODUCT DETAILS: Wilbur Curtis G3 Alpha Decanter Brewer 64 Oz Coffee Brewer, 3 Station, 3 Lower Right Warmer - Commercial Coffee Brewer - ALP3GTR12A000 (Each). Gold Cup Series™ – Digital Control Module provides precise control over all brewing aspects: time, temperature, volume plus specialty coffee needs from pre-infusion to pulse-brewing to water bypass Intuitive Scroll-Through Precision Programming – Large, brightly lighted display communicates functions at a glance. Easily adjust time, volume, temperature, brew functions and more. Tamper Resistant – Changeable access code prevents unauthorized adjustment. NOTES: Professional Installation Required; Dedicated Water Line And Power Supply (Not Included) Within 4'-6' Of Brewer. 120 Cord And Plug Included. Gold Cup Series - Digital Control Module provides precise control over all brewing aspects: time, temperature, volume plus specialty coffee needs from pre-infusion to pulse-brewing to water bypass.